We have a mailing list of people looking for this dog from their childhood. 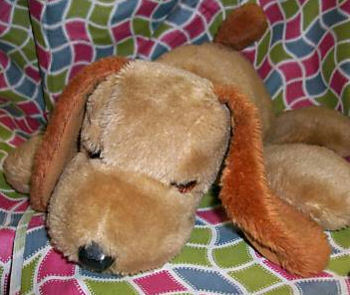 I’m looking for a late 70’s Napper the talking dog made by Mattel that is still in working condition. He would say phrases such as ”I’m lonely”, ”Ruff, Ruff, Ruff”, and some others. He was my favorite childhood toy. Mine stopped talking years ago, and I would give anything to hear him again! I am looking to buy one and then switch the voice box, so it must be in good working condition. ebay #170884054969 still in box. Bid item. Currently no bids and reserve not met. Bid opens $99.99 + shipping. Thanks, Carlie! Not sure if anyone would be interested, but it’s sent.